This case study discussion seeks to show with the use of quantitative pressure measurement apparatus how foot stability and plantar (sole of the foot) pressure distribution in the cycling shoe can be improved with the use of appropriate orthotic devices. In most cases cyclists need their feet to be relatively stable in the shoe with pressure evenly distributed across the ball of the foot (the padded portion of the sole between the toes and the arch, underneath the heads of the metatarsal bones). Excessive movement through the foot in cycling can cause friction and compression injuries to the soft tissue. In addition, it has been hypothesised that a more stable and rigid foot will transfer power better than one that is not. In relation to plantar pressure distribution, the ball of the foot acts as the interface between the pedal, effectively transferring force from the lower limbs to the bike. Therefore, from a performance perspective, in order to maximise force transfer efficiently it is important that the majority of plantar pressure is located in this region. In terms of comfort, where force is distributed over a small contact area, high pressures, and in many cases, discomfort result. A number of case studies are presented below. The first two show the effects on foot stability and plantar pressure distribution when using BikeFit ITS wedges and the last two when using Solestar Kontrol insoles. No other fit parameters, such as cleat position, were changed in these examples. 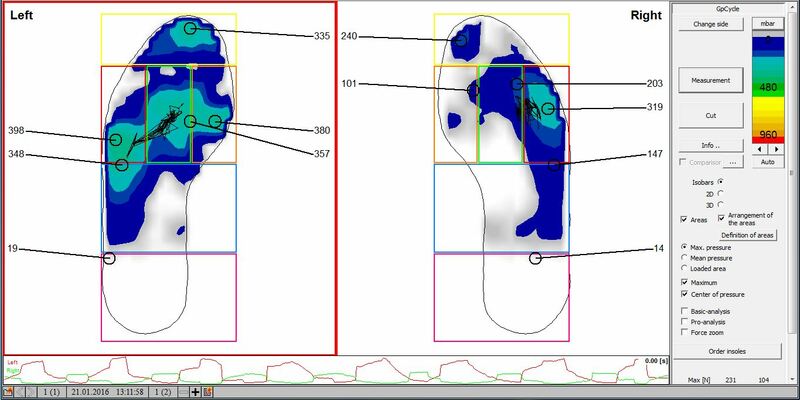 Before a discussion of the case study results can begin it is important to understand the data shown below in the plantar pressure distribution maps. The distribution of pressure is indicted by the shaded areas and the magnitude of pressure by the colour – with dark blue indicating relatively low pressure and red relatively high. The black lines represent the movement of the centre of pressure of the foot during the data acquisition (data is captured over a 5 – 10 second period whilst the subject is pedalling). The boxes overlaying the outline of the foot isolate areas of importance, namely: the toes; lateral, mid and medial forefoot; mid foot; and heel. Figure 1. 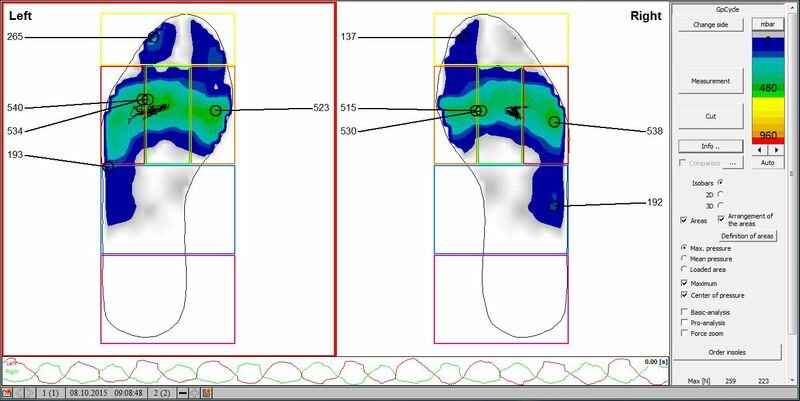 The case study below shows the plantar pressure maps of subject #1 for both the left and right feet without the use of any orthotic devices (pre-orthotic), and following, with the use of 1 x 1.5 degree ITS varus wedge in both shoes (post-orthotic). The images show a moderate reduction in pressure on the lateral forefoot and an increase on the medial forefoot in both feet resulting in a more even distribution of pressure across the entire forefoot. In addition, the images also shows a significant improvement in foot stability, particularly in the left shoe. Figure 2. 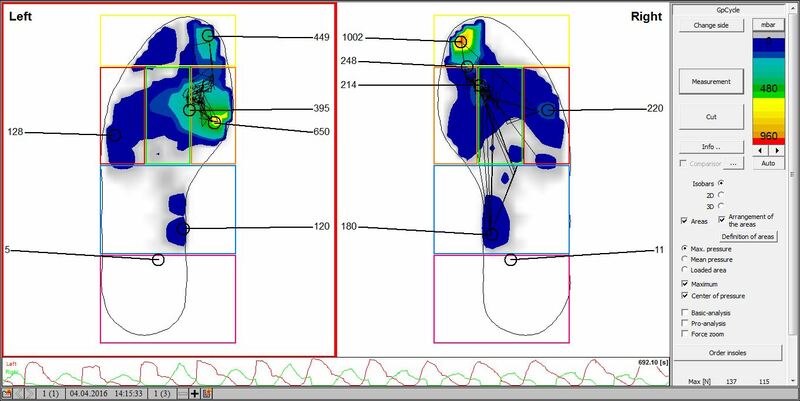 The case study below shows the plantar pressure maps of subject #2 for both the left and right feet, pre and post-orthotic. In this case a 1 x 1.5 degree ITS varus wedge was used in the right shoe. The images show a material shift in pressure from the lateral to the medial forefoot in the right foot as well as an improvement in foot stability. Figure 3. 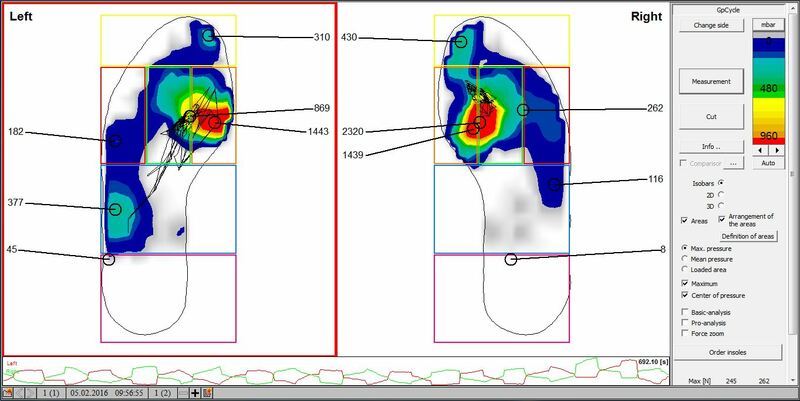 The case study below shows the plantar pressure maps of subject #3 for both the left and right feet, pre and post-orthotic. In this case a pair of Solestar Kontrol insoles were used. 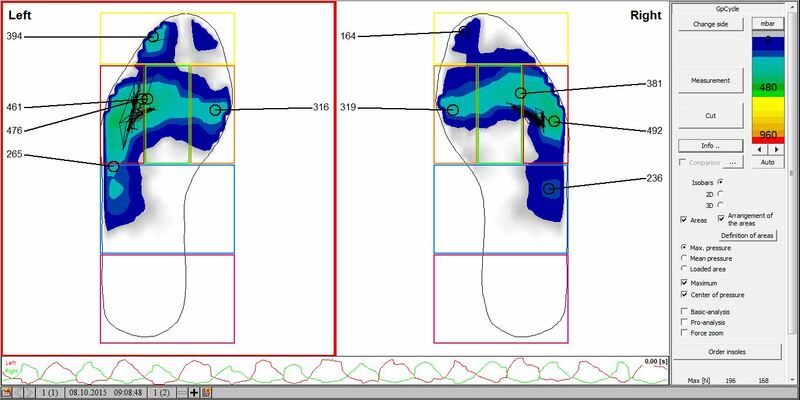 The images show a much more consistent distribution of pressure when comparing the left and right feet, as well as a significant improvement in foot stability. In addition, there is also a reduction in pressure under the hallax (big toe) of the right foot. This may be due to the fact that in instances of foot instability individuals may curl their toes to compensate. In this case, the increased stability in the foot has likely resulted in a relaxation of the big toe. Figure 4. 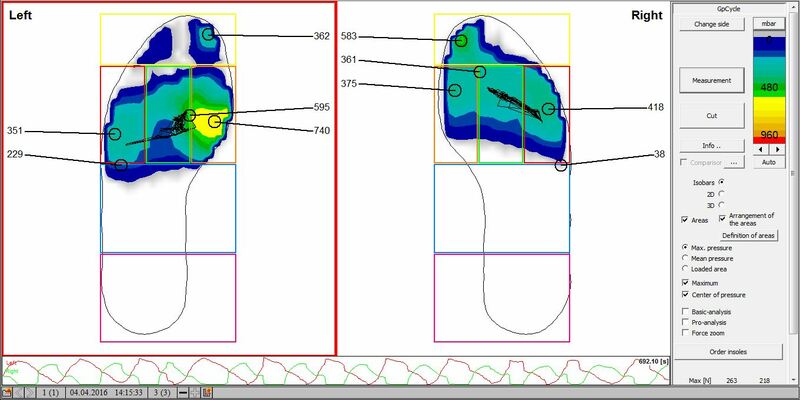 The final case study below shows the plantar pressure maps of subject #4 for both the left and right feet, pre and post-orthotic. Once again, in this case a pair of Solestar Kontrol insoles were used. The images show a material reduction in pressure in the medial forefoot, resulting in a more even distribution of pressure and an elimination of the high pressure points in both feet. A significant increase in foot stability can also be seen. These case studies show how with the use of the gebiomized GP Cycle Plantar Pressure Mapping System we are able to select the appropriate orthotic devices to increase performance and comfort through improved foot stability and plantar pressure distribution.